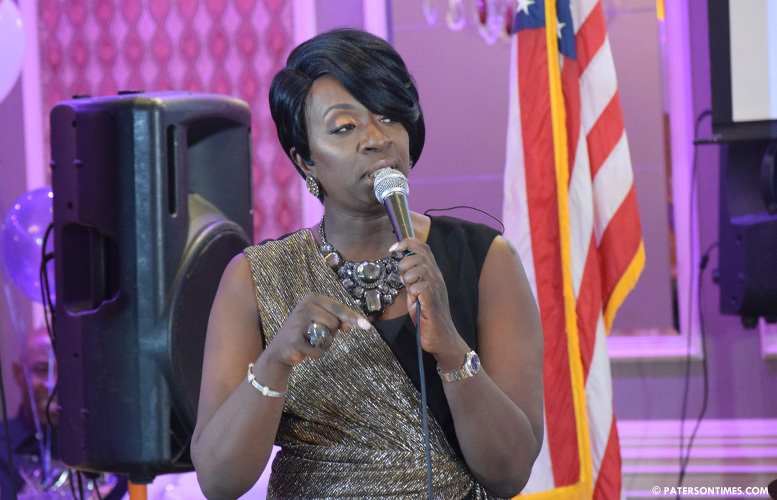 School board member Lilisa Mimms kicked off her campaign for an at-large city council seat on Friday night promising a “better” Paterson to hundreds of her supporters at the Brownstone House. Mimms walked up to the front of the audience to the tune of Hezekiah Walker’s gospel song “Better” to share her campaign platform with 350-400 people. She lamented the state of the city: high taxes, dependence on state aid to balance budget, and reduction in recreation spending. “We must eliminate wasteful spending,” Mimms told the audience. “One way to minimize wasteful spending is by holding the administration accountable.” She also wants teams in all six wards and wants to hold townhall meetings. Townhall meetings seldom attract residents in Paterson. Mimms suggested she would increase recreation line item in the municipal budget. She claimed that line item was just $1 million. The city spends roughly $2.5 million on recreation, according to municipal budget documents. Homeowners have shown little interest in increasing recreation spending in the city. It will mean paying more taxes. Voters rejected disgraced mayor Jose “Joey” Torres move to levy a new tax to increase recreation spending. Mimms said she will initiate conversations with the likes of the Passaic County government to secure more funding to create recreation opportunities for young people. She has attempted to gather funds from private firms. For example, she urged a developer, who came before the Paterson Planning Board, to assist in making improvements to Barbour Park. The developer, Elizabeth-based Paramount Assets, purchased the old Department of Labor building on Broadway, walking distance away from the park, to open a Walgreens and a laundromat. Mimms, a founding pastor at the New Beginnings Christian Outreach Ministries, was appointed to the planning board by Torres. She serves as its vice chairwoman. She juggled being a member of the planning board and being a member of the school board — both have meetings on Wednesdays. Mimms’ term on the school board ends in January. Mimms was elected to the school board three years ago. She finishes a single, three-year term, next year. She unsuccessfully ran for the 3rd Ward council seat in 2016. Mimms came in third place in that bitter four-person race. In last year’s race, Mimms described councilman William McKoy as “expired.” This remark greatly offended the longest serving member of the city council. However, she has mended ties with McKoy. The councilman’s wife was at Mimms’ kickoff event. Mimms appears to have expended extra energies to have a diverse crowd of people at her kickoff event. A campaign worker solicited non-African-Americans attendees to pose for pictures with Mimms to highlight diversity at the event. “I plan to be a voice for all people,” said Mimms. She will need votes from the city’s many different ethnic communities in order to secure a win. The at-large race, which will likely be overshowed by the mayor’s race, includes incumbent council members Kenneth Morris and Maritza Davila. Morris is the second longest serving member of the council. There are also declared challengers former school board member Juan “Mitch” Santiago and former councilman Mohammed Akhtaruzzaman. There will be three available at-large council seats in next year’s election. Incumbent Alex Mendez is giving up his seat to run for mayor. Mimms received endorsements from council members Ruby Cotton, Luis Velez, and Andre Sayegh. Mimms’ supporters say she has been a powerful voice for children on the school board and is prepared for a council seat. “I think she did a really good job at the board of education,” said Joann White, 59, of the 5th Ward. She hopes Mimms will vote down tax increases. White said tax hikes have translated into rent increases. “My biggest concern is crime,” added Peter Emeka, 32, of the 4th Ward. He wants the city to hire more police officers to improve response time. Emeka is still undecided. Election is more than six months away. He wants to hear what other candidates have to say about addressing the city’s chronic crime problem. “We need someone whose work and intentions will benefit the people and not their own pockets,” said Mimms. Her comments can be viewed as a vague reference to the prison sentence Torres received this week for stealing from taxpayers to benefit himself and his family. Mimms’ event had two sections. A special reception that cost $100 and a general portion that cost $40.